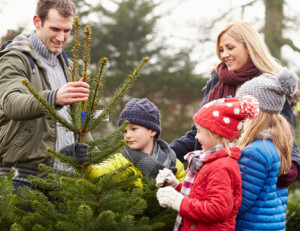 Before setting up your tree, make a straight cut across the base of the trunk ad place it in a stand that can hold a gallon or more of water. Making a fresh cut on the trunk allows it to absorb water more freely and stay healthy longer. The tree will absorb the greatest amount of water in the first 24 hours, so be sure to check it and add water as needed. If the water level falls below the base of the trunk, it will begin to dry out the stump within 4-6 hours. Adequate water not only keeps the tree fresh longer, but helps it maintain that fresh tree fragrance. This entry was posted on Friday, November 16th, 2018 at 7:26 am	and is filed under News & Updates. You can follow any responses to this entry through the RSS 2.0 feed. Both comments and pings are currently closed.